Welcome to our 10-minute beginner’s guide to surfing. In the next 10 minutes, we’ll cover everything you need to know to get started with your new hobby. That means explaining what surf gear you need and why, how to surf, how to find local spots, fitness and even etiquette on the waves. 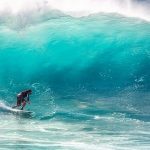 What Swell Is Best For Surfing? Before you get out on the ocean, you’re going to need some gear. That’s why we’ve created the essential surfing equipment list to help you pick the best gear as a beginner. The first thing you need to determine, is which size surfboard you need. The length of the board isn’t just determined by the types of waves or surfing you intend to focus on. It also comes down to your weight and height. The best beginner surfboards are those that are thick and long. The extra volume provides stability and buoyancy; that’s going to make learning to surf much easier. You’ll see intermediate to expert surfers riding tiny boards in the 6ft-7ft range. 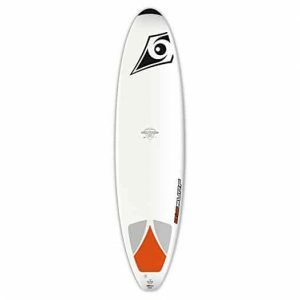 But realistically, newer surfers should be leaning towards something in the 7ft-9ft range. There’s a tonne of great boards on offer from BIC. Surfboards can get dented easily. And, they aren’t exactly cheap. A lot of companies will bundle a board bag with their boards, but not all of them. If you’re purchasing a surfboard that doesn’t come with a board bag, get one; you’ll want to protect your investment. Like the surfboard bag, check that your surfboard package deal doesn’t include a leash before going and purchasing one. 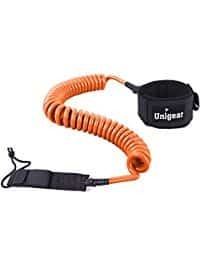 When you bail (which you will), a surfboard leash will stop your board disappearing into the distance. More importantly, it stops it smashing into other surfers on the waves. Get a board or fin to the head, and it really hurts. You don’t wax a surfboard for the same reason as you would a skateboard. For skateboarding, you’ll wax up the deck to help to reduce resistance when grinding. With surf wax, you’ll wax up the top of the board for grip. Boards, especially new ones, are ridiculously slippery. When paddling out on a board, even the movement of each arm stroke will see you slip off your board. Waxing your board helps to combat this. If you’re in an area where the sea temperature is high and you can live without a wetsuit, congrats, you’ve just saved yourself some cash. But, even some of the warmest waters are much below body temperature. And, it doesn’t take long for water to adjust our core temperature below what’s comfortable. When choosing a wetsuit for surfing, there’s two things you want consider. First, you want a panel on the chest. Usually, this is going to look like a shiny rubber. 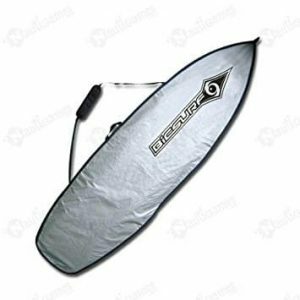 It gives you better protection against the wind out on the ocean, but it also helps to offer extra grip when paddling out. Which Wetsuit Do You Need For Surfing? Don’t be fooled by outside temperatures and think you don’t need a wetsuit. The difference between air temperature and sea temperature, is not always as close as you might think. You can check out the different ocean temperatures here. And remember, this going to change depending on the time of year. 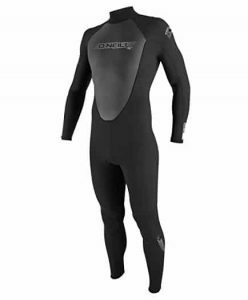 If the sea temperature is around 0°F, you’ll need a 6/5/4 sealed wetsuit. And, you’ll want one with a hood. This drops to a 5/4/3 around 45°F and then a 4/3 if the temperatures around the 55°F mark. The most popular wetsuits are the 3/2 and 2/3 for temperatures above the 55°F mark. These are basically summer wetsuits for surfing. 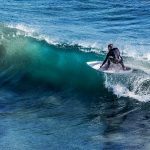 Which Is The Best Surfing Wetsuit Brand? I use O’Neill. They’re a well-known brand, durable and cheap. If you grab last year’s model (i.e. the 2017 model now the 2019 line is out), you can usually make savings of 15% upwards. 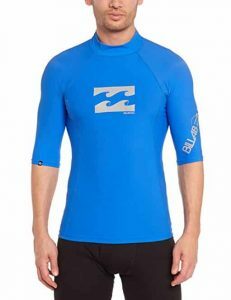 A rash vest is designed to be worn under your wetsuit. As you paddle and surf, you’ll get slight chaffing around the chest and arm area. That chaffing is only emphasised by the fact that the salt water will dry out your skin the longer you stay in the water. A rash vest for surfing is designed to combat that exact problem; chaffing. For those that are surfing in areas where boardshorts are all you need, you can use a rash vest to give a little warmth, but also protection against the sun and UV rays. If you’re surfing in temperatures that require a wetsuit that’s a 4/3 or thicker, you’ll want some additional cold weather surfing gear. Boots won’t just keep your toes warm, they’ll protect you against rocks if you surf on beaches where it’s not just golden sand. Although you’ll want these for any surf you go on with a 4/3 wetsuit, it’s advisable to wear them if you plan to spend an hour or more in the sea. And, that includes you surfers wearing a 3/2 or 2/3 wetsuit. Even higher sea temperatures can drop body temperature considerably. And, a decent pair of boots will offer you more grip on the board too. 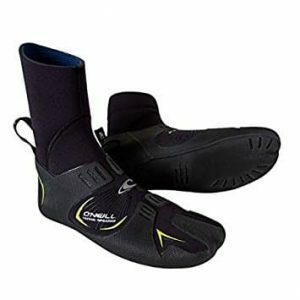 O’Neill do a good range of wetsuit boots. Gloves are made from the same material as wetsuits. 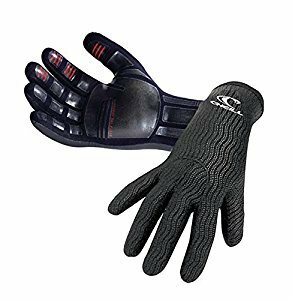 If you feel the cold, or plan on surfing in sea temperatures below 45°F, I’d recommend taking a set of wetsuit gloves with you. O’Neill do a fantastic range of wetsuit gloves. Next, you need to find somewhere to surf. There is one annoying thing about surfing; surf spots can go flat extremely quickly. I wouldn’t advise just turning up to a surf spot and hoping for the best. As a beginner, you want waves that are small enough that the learning curve isn’t too steep. At the same time, getting to a surf spot only to find it’s completely flat is a wasted trip. Keep an eye on surf forecasts. These show all the bests spots, but what the predicted swell is going to be. There are two popular sites that offer surf forecasts. The one I use is Magicseaweed, perfect for anyone in the UK (but, it is a global resource). But, there’s also Surf Forecast. There’s a lot of factors that determine the quality of the swell. Some are related to the individual spot and underwater features (reefs), the tide, wind (including direction) and so on. Waves are forecasted in sets. 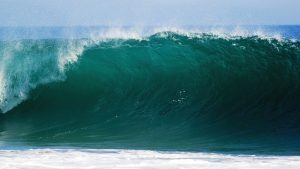 What you look for is a reasonable sized wave, with a long gap between individual waves. Small waves are good for beginners. So, if you see a forecast of 2-4ft, that’s perfect. The gap between waves is a “bigger the better” scenario. That’s a sign of a bigger and stronger waves. Sets with short gaps will generally be choppy waves that fade into each other. It doesn’t just make for an unpredictable swell on the wave, it makes paddling out ridiculously difficult. As a complete beginner, I’d suggest looking for waves just over 2ft, and no bigger than 5ft. Paddling strength is something that builds up with experience. And, so does riding the waves. Riding waves above your capacity will lead to you missing the majority (due to lack of paddling technique). That means it will take you much longer to learn how to surf properly. Now you’ve’ got your gear and have found some local spots, it’s time to learn how to surf. A lot of popular surf spots will have companies offering lessons for beginners. Having just 1-2 lessons is useful. Instructors will be able to give you some basic foundations to work with, and offer advice. That’s going to mean that you learn good habits, and pick up each aspect of surfing quicker than doing it on your own. Learning how to paddle on a surfboard isn’t as easy as it looks. The first hinderance you’ll find, is paddling strength (skip to surfing fitness for paddling exercises). The second, is balance. With each paddle stroke the balance point of the board will move. And, each wave or ripple is going to do the same. Many instructors will spend an hour or more, just on paddling. That’s to build up some strength, technique and for you to get used to finding the right balance point on the board. Paddling out is rarely an issue with waves under 5ft. Catching a wave using paddling is much harder. It’s important not to send your centre of gravity too far forward. If you do, you’ll be sent into a nosedive. When paddling for a wave, you’ll need to constantly adjust your centre of gravity. If you’re paddling fast enough, the wave will catch you and it will steepen, so your balance point becomes further and further towards the back of the board. And, with one smooth movement you’ll lean further back, and transition into popping up. There’s another reason why beginners should stick to smaller waves. To get out to where waves are breaking, you need to get through them. And, that means paddling; hard. Unfortunately, beginner surfboards are designed to be extremely buoyant. That makes duck diving under waves extremely difficult. Give it go, but if your board is over 8ft, there’s a good chance you need to roll to get through the surf. With a smaller board, duck diving is easy. You sink the front of the board by placing both hands towards the front and shifting your body weight forward, whilst extending your arms. As the board sinks, you’ll push down on the back of the board with your foot or knee. That levels out the board underwater. As the wave comes across you, you’ll lay flat on the board. 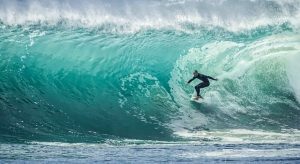 Surfboards are incredibly buoyant, so to get back to the surface, you simply need to angle the board up to the surface, and then continue paddling. A much more suitable way to get through the surf for beginners is to learn how to roll. Different people call it different things (turtle, barrel, Eskimo etc), but the technique is all the same. Because beginner boards (and longboards) are so buoyant, you’ll struggle to sink them for a duck dive. And, that means you’re going to get ripped to pieces by the incoming wave. Learning how to turtle roll isn’t difficult. Just before the wave’s impact, you’ll flip the board upside down, keeping it close to your body. Unlike a duck dive, the wave will send you towards the shore, so you’ll want to lightly kick to keep yourself going too far inwards. Once the wave has passed, you’ll flip back over and paddle hard to try and beat the next break. Popping up is a skill that takes time. Much like the turn in snowboarding, it’s crucial if you want to progress as a surfer. Learning how to pop or stand up on a surfboard takes practice. But, it’s something you can do by slowly building on some basics. It’s much easier to learn on small 2ft-3ft waves. Start by arching you back and moving your centre of gravity backwards. Then try following that through to surfing the wave on your knees. This allows you to find the balance point on the board. Then you’ll need to combine that with a smooth pop up so your front foot is near the middle of the board, and your back foot is near the tail of the board. It’s a trial and error learning process. If you lose balance and fall backwards, your centre of gravity is too far to the tail of the board. This could be your lean angle, or foot placement too close to the tail. Nosediving is much more common, because it’s not just gravity that makes you bail. If your centre of gravity is too close to the front, as you catch the wave you’ll see the nose dip under the water. This is pretty much game over. 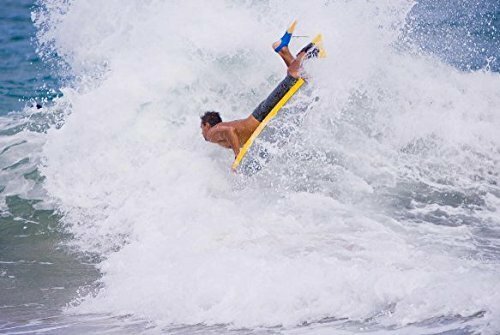 If you keep nosediving, focus all your attention to pushing weight and body angle further to the tail of the board. It’s much easier to counterbalance too much weight at the tail, than it is to counter too much weight at the nose of the board. There are two types of turn on a surfboard, a smooth turn, and a carve. The faster you go on a board, the easier it is to turn, and that then transitions into carving. As you’ll be focusing on smaller waves with less power and less speed, you’ll want to focus on smooth turns. In fact, on the smallest waves (going extremely slowly), I’d avoid turning all together. The lack forward momentum just won’t allow you to turn. As you turn you’ll scrub off speed and you’ll lose the wave. The slower you go, the more unbalanced your board will become. Turning is a simple case of moving your torso and looking at where you want to turn. Combine this with a slight lean of your feet and that will dig in the rail of the board into the surf, change the centre of gravity and you’ll be begin to turn. Carving is more for intermediates than beginners. Not just because the technique itself requires more experience, it’s usually done on waves bigger than what you’ll be used to as a beginner. Once you do get to bigger waves carving is a technique used not just for fun, but to keep you at the point of the wave that’s go the most power, just after the barrel, or where it’s breaking. Very few injuries are directly to do with surfing manoeuvres, or an actual fall. If you don’t complete a trick or carve correctly, you’ll just fall into the water. Injuries are usually related to how and where you fall, in comparison to your board. You want to fall backwards, behind your board, not forward in front of it. After a fall, it might take you a few seconds to retrieve your board, and by that time, a wave could take it straight into you. As soon as you fall, you’ll be getting taken for a ride underwater by a wave, don’t panic. Protect your head and face with your arms and as you surface use one arm to figure out if your board is above your head; fins hurt! Don’t try and catch your board just before a wave. Especially if you are in the path of where it’s about to go. Wait it out. It’s not going to go anywhere; that’s what your leash is for. We’ve already established that surfboards can be slippery. And, adding wax to the top of the board is going to help to stay on it, not just when you paddle, but when you stand up and carve too. Bits of dirt and especially sand that gets waxed in, are going to ruin the chest panel on your wetsuit. You need to get rid of all of it. 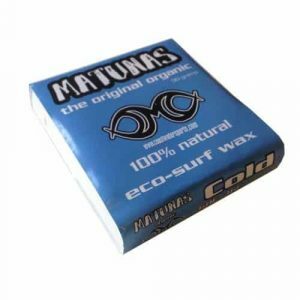 If surf wax has been applied previously, you’ll need wax remover. Really-old wax won’t work as a solid base. It will flake off quickly. There’s no right or wrong way to wax a surf board. But, what you are looking for is small bumps of wax. This will create better contact patches and give more grip. Work the wax front to back, side to side and in circular motions so the board is covered, and bumps start to appear. After each surf, bits of wax will be worn off the board. You’ll want to add a light coat of wax every now and then. If the wax has become smooth and offers no grip you have two options. Either remove the wax and re-wax the board. Or, use a wax comb to create rough contact patches. 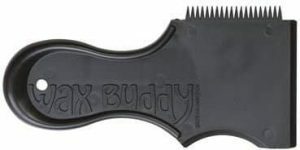 Using a wax comb will mean you’re not completely rewaxing as often. You might think the only barrier to getting good at surfing is your technique. It’s not. The first time you go surfing as a beginner you’ll notice one thing; paddling is demanding work. As you progress from a beginner you’ll need to catch bigger and bigger waves. The bigger the waves, the harder it is to break through the surf, and the harder they are to catch. The bigger the wave, the harder you need to paddle. So, although there’s a lot of core strength involved when it comes to surfing, as a beginner, you should be focusing on improving your paddling strength. So, here’s the best exercises that are going to help improve your paddling strength. Remember, you’ll only feel the benefit of any exercises you do if you rest. Muscles need time to rebuild. Try to give muscles 2-3 days between any kind of workout to rest and recover. For surfing, you’ll need a combination of stamina and strength. So, that doesn’t mean lifting the heaviest weights you can for just a few reps. Aim for 10+ reps for each exercise, and try to do 2-3 sets per training session. The number one way to improve your paddling strength, is simply to paddle. Gym (or home based) exercises will help, but there’s no substitute for the real thing. If you live near a surf spot, and the forecast is pretty-weak, don’t be put-off from getting down there and paddling around. Any session paddling is going to improve your strength for when the surf is good. If you want a high-impact workout that can be completed in as little as 4-minutes, we’ve got just the thing for you; Tabata workouts. Tabata workouts are a form of high intensity interval training. Sound good? We’ve created a guide to Tabata workouts here. Tricep dips are going to strengthen the back of your upper arms. Any strength building in the upper part of your body (wrists, triceps, biceps, shoulders and upper back) is going to help improve your paddling strength. Dumbbell front raises will help to build out your shoulder muscles. There’s a good chance after your first-time paddling, you’ll feel them burning. Dumbbell raises will help improve their strength, so you can paddle harder for longer. Upright rows are an all-round exercise for your upper body, working everything from your deltoids, to your biceps. Another exercise that helps improve shoulder strength for paddling. As a beginner, try and avoid spots that are packed full of surfers, especially if the wave size is a little bigger than what you’re used to. We’ll jump right onto who has right of way in a second, but know this. If you make someone yield to a wave because it’s your right of way, but can rarely catch any of the waves, they’re going to get pretty-angry pretty-quickly. If you’re in the perfect position for the incoming break, but someone is already on that wave, you shouldn’t drop in on them. If they want to carve, there’s a good chance you’re going to tangle. Have respect for others. Shortboarders will have a tougher time catching a wave than those on big beginner boards and long boarders, due to their lack of buoyancy. You should be letting others catch waves, even if you’re in position. The surfer closest to the break or peak of the wave, always has right of way. So, if the wave is breaking close, but it will break for another surfer first, they have the right of way. But, why can’t you just get into a better position? You’ll see surfers lined up ready to catch waves. So, why can’t you just paddle around them, so you are nearest the break and have right of way every time? Cause’ that’s called snaking, and it’s not cool. Get into a good position, and hopefully other surfers will follow the above rules. They’ll respect the fact you’ve not snaked to get in front of them, and will allow you and others to catch waves too. Whether someone’s accidently dropped in, is coming up on you by paddling, or you’re about to bail; do your best to control your board, keeping it as close as possible. Most injuries out on the water come from boards hitting other surfers, not bailing. Never chop off a surfer already riding a wave by paddling in-front of them. If they’ve noticed you, there’s a good chance they’ll stop carving to gap the white-water and allow you a gap to paddle through. If not, it’s unfortunate, you’ll have to roll, duck dive, or just take the white water on the chin. Surfers won’t expect you to paddle in-front of them. If you do, you’re going to ruin their ride, but it’s you that’s going to come off worse. Being smashed in the head with a board or being caught by a fin, really hurts. Most surfers abide by the same rules. But, if you’re visiting a surfing hotspot, check for signs. Some beaches have signs specific to surfing etiquette. So, check your familiar with their specific rules. Pumped to start surfing and want to keep reading up on your new hobby, or checkout some videos? Below are the best websites and YouTube channels for beginner surfers. Finding surf spots and forecasts is easier than ever. Get over to Magicseaweed or Surf Forecast and save them to your favourites. If you surf the same spots, you’ll quickly get to know the locals. But, if you’d prefer to find a partner to go with every time, there’s a cool group on Meetup.com. Their Surfing group has over 270,000 members and over 400 Meetups globally. From product recommendations, tutorials and interviews with pros, Surfer has it all. You can check them out here. Looking for some epic surfing videos? Checkout these YouTube channels. Everything from tutorials, to surf life, and of course, the odd crazy surfing video, like the blindfold surfing one below. With over 50,000 subscribers, the Surf Channel isn’t the biggest, but it is one of the best. Thanks for reading our 10 minute guide on how to start surfing. Found this article useful? Bookmark it for later. Also, jump on our email list and we’ll send you more surfing tips and product recommendations, the minute we publish them.